British writer-director John Michael McDonagh's 2011 "The Guard" and 2014 "Calvary," both set in Ireland and starring Irish actor Brendan Gleeson, were two of the best films of those years. McDonagh's brother and fellow writer-director Martin had similar success with 2008's excellent "In Bruges," starring Gleeson as one of two Irish hitmen hiding out in Belgium. Unfortunately, what happened next for both brothers was America (without Gleeson). Martin's 2012 "Seven Psychopaths" was an enjoyable enough small-time-crooks piece set in Los Angeles, but a definite step down from his debut. 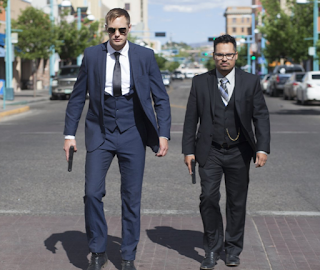 "War on Everyone" is John's latest, a violent buddy-cop parody based in Albuquerque, New Mexico. It's consistently outrageous but rarely as funny as it wants to be, with an inconsistent tone that unsuccessfully attempts to mix silly slapstick with beatdowns and bullets. Terry Monroe (Alexander Skarsgård) and Bob Boloña (Michael Peña), back on the job after an assaulting-a-fellow-officer sabbatical, are blithely brutal, casually corrupt and very politically incorrect. Single Terry loves Glen Campbell, alcohol and beating up scumbags. Family-man Bob isn't above taking home a suspect's money, flatscreen and X-Box in exchange for not arresting their owner. Both are deadpan low-key and seem dangerously incompetent, but as one of them notes, "Chance favors the bold." Along with a domestic-case murder, their main concern is a robbery involving resentful snitch Reggie X (Malcolm Barrett). When Terry and Bob try leaning on him for information, Reggie notes that he is "familiar with the whole cop-informant dialectic," one of many clever meta-hardboiled dialog touches. The movie's big bad guy is "Your Lordship" Mangan (Theo James), a wealthy Brit first seen shooting up in one of his horse stables. When things get personal between him, Terry and Bob, it's car-blowing-up, eye-punching-out and lots-of-fatal-gunplay time. The problem with trying to make Terry and Bob's reflexive bad behavior appealing is that both are so blank-faced and blasé about it that what's supposed to be their amusing lack of excitement gets boring. Some sight gags actually work, such as when they wonder if their firing-range targets—both featuring black men, one with his hands raised in surrender—might be racist. There's also a sense of the absurd that occasionally elevates the "'Bad Santa' in police cruisers" crudeness. Best example: After the two jet to Iceland in pursuit of a suspect, Terry asks what their plan is for finding the guy. "Stand around here and keep our eyes open," Bob replies, immediately adding, "There he is." "War on Everyone" (and yes, that is a genuinely terrible title) may have read better on the page than it plays on the screen, where too many scenes include painful pauses for laughs that don't come. Bob dismissively stating that Pythagoras believed the human soul migrated into a green bean after death, or that Elvis and Judy Garland both died on the toilet, are entertaining tossed-off asides. But when a car runs into a trash can in what looks like an homage to the cult-favorite sitcom "Police Squad," "War on Everyone" definitely comes up short in comparison.